We had our grand opening for our new shop on April 12th and it was a great occasion and enjoyed by everyone in attendance. The gang from WLR fm were there broadcasting live and giving out prizes. The new shop was packed full and everyone had smiles on their faces, we even had the Easter Bunny turn up to hand out sweets. The fun didn’t stop there, we also had our popcorn cart and were handing out free popcorn, Megan Cassidy was also there in the arts n crafts corner making things for all the kids that turned up and they also got their faces painted. Overall it was a great day and we can’t wait to have more like it in the near future and we hope if you’re reading this you might pop along and have a great time visiting us at PartyWorld. Below are some picture we took of everyone having fun at our grand opening. Next time you could be in one. This entry was posted on Monday, April 21st, 2014 at 10:39 am	and is filed under PartyWorld News. You can follow any responses to this entry through the RSS 2.0 feed. You can leave a response, or trackback from your own site. The blog is our digital heartland. 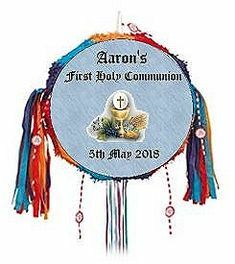 Personalise our Pull-String #Communion Boy #Pinata with whatever message you like. 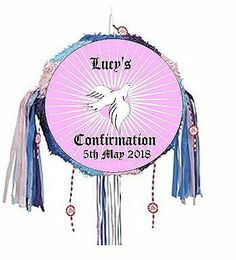 A colourful pull-string pinata like this is great for all ages providing perfect safe fun for this most traditional of party activities. Quantity Per Pack: - 1 Communion Boy #Pinata. Please put your #personalise message in the box provided.